Tens of thousands of people took part in a rally today in support of nurses and midwives who are involved in a dispute over pay and staffing levels. 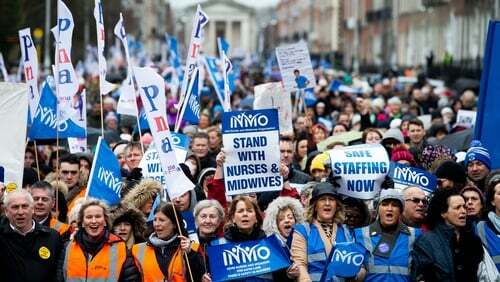 Nurses, midwives and members of the public marched from the Garden of Remembrance at Parnell Square in Dublin to Government Buildings on Kildare Street. The Irish Nurses and Midwives Organisation, who organised the demonstration, said it showed the Government the level of public support for the nurses in their industrial dispute. The rally follows three days of strike action with three further 24-hour stoppages due to be held next week. Addressing the crowd, Phil Ní Sheaghdha, General Secretary of the Irish Nurses and Midwives Organisation, said that further strikes are scheduled for next week and the week after, and "if it requires it the week after and the week after". Ms Ni Sheaghdha said: "We have started a campaign that we intend to finish." Nurses are demanding an across-the-board pay rise, to bring them in line with other healthcare professionals like physiotherapists. Today’s rally was led by young nurses wheeling suitcases to highlight the numbers of nurses who are currently working abroad. Meanwhile, exploratory talks are continuing this evening at the Labour Court between nursing representatives and health service managers. The talks were adjourned last night after nine hours. Representatives from the Psychiatric Nurses Association have finished their exploratory talks with officials from the Labour Court, for now. They spent three hours sharing information and concerns about the "retention and recruitment crisis in mental health services" and suggesting possible solutions, according to PNA General Secretary Peter Hughes. "It was an exploratory discussion and we'll just have to wait and see, but as it stands we are still planning three days of strike next week and hopefully the matter can be resolved before that," said Mr Hughes. The Psychiatric Nurses Association represents around 6,000 nurses. It is planning six strike days over the coming fortnight. The talks are continuing between the INMO, the HSE, the Department of Health, the Department of Public Expenditure and Reform and ICTU. The Minister for Health Simon Harris has reiterated the Government's willingness to engage to end this dispute. A spokesman said that the Minister welcomed the resumption of Labour Court talks this afternoon and he was urging all parties to continue to work as hard as possible to reach a resolution.